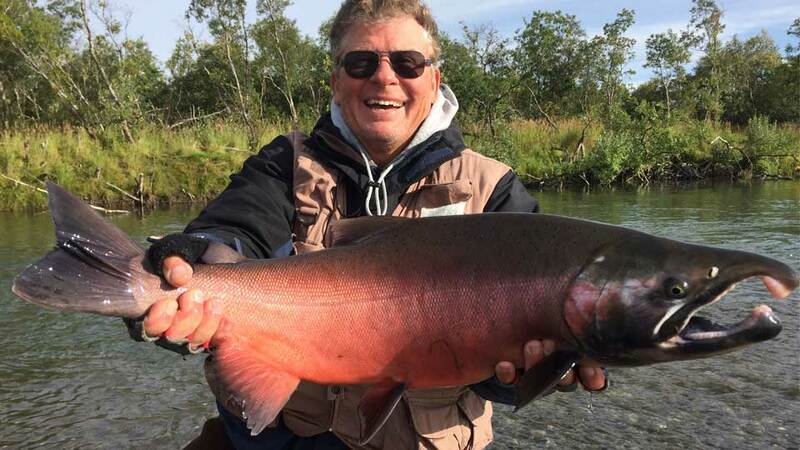 Lower and Upper Camps + 90-mile Float Trips - The Kanektok also known as the “Chosen” is an unbelievable Alaskan river located some 400 miles southwest of Anchorage, and flows through the majestic Togiak National Wildlife Refuge. Fly fishing only with barbless hooks. Strict catch and release. 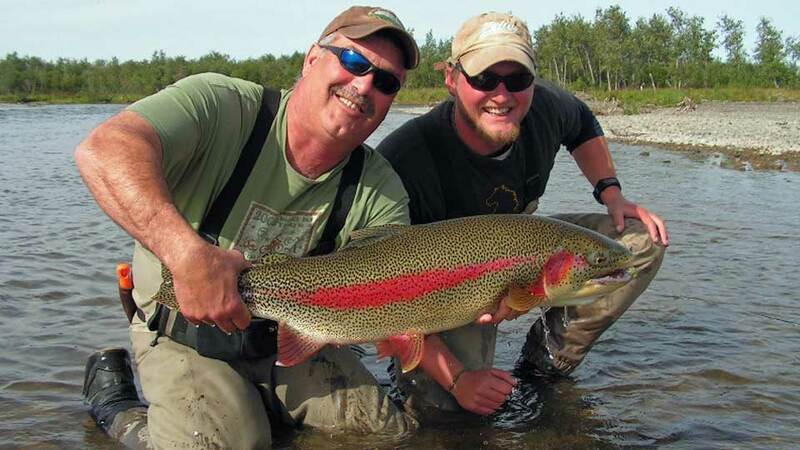 Dave Duncan & Sons have guided in remote Alaska for over forty years. 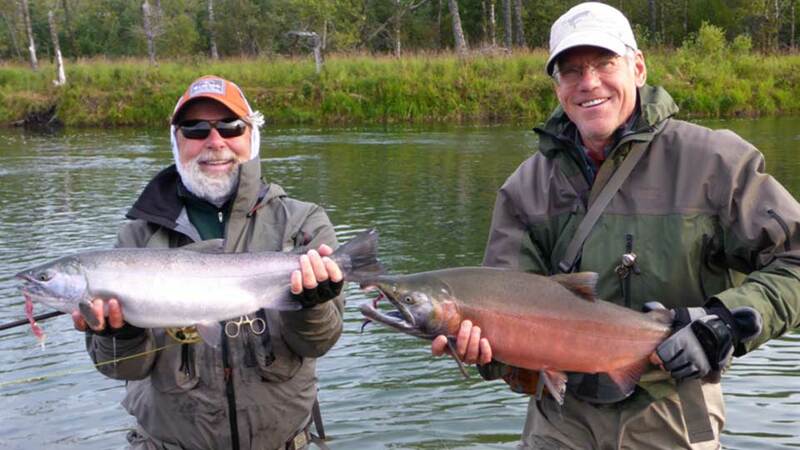 They feel fortunate to be located on one of the best, if not the best river in Alaska. 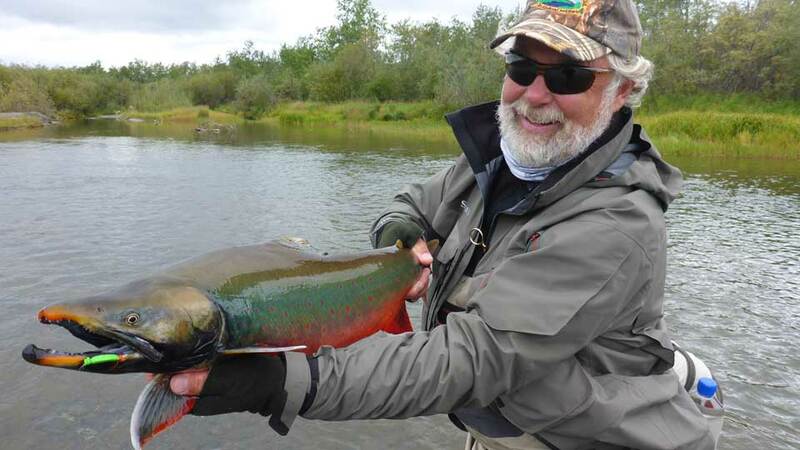 Very few rivers have incredible fishing for leopard rainbows, all five salmon species—king, silver, chum, pink and sockeyes—Arctic char, dolly varden, and grayling. 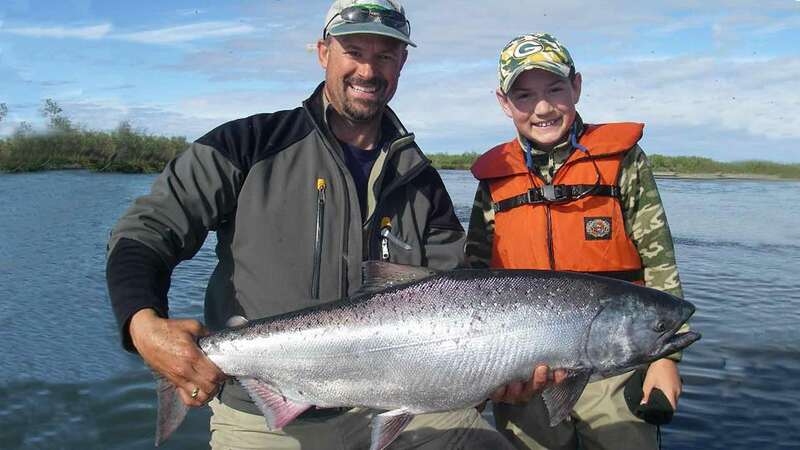 What makes the Kanektok River world-class is its fish-ability. With its many braids or side channels, it feels like a much smaller river and is ideally suited for fly fishing. 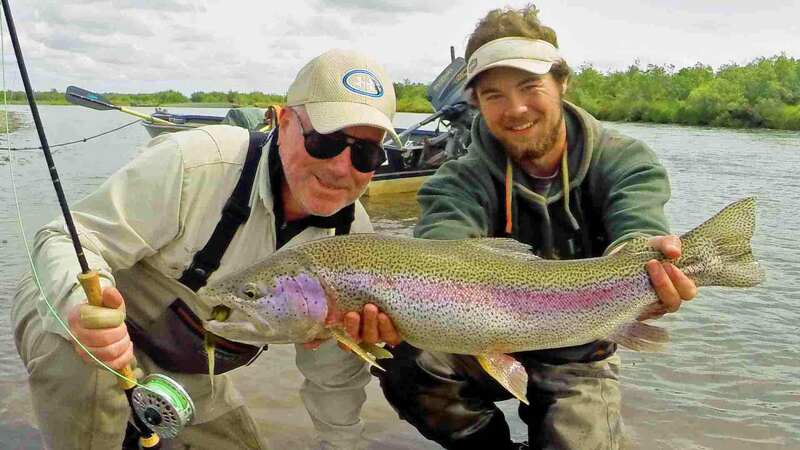 The Kanektok is one of the best places in the world to fish a mouse pattern for big rainbows! Occasionally, anglers catch a live mouse and throw him in for a swim. The Duncans have two base camps on the Kanektok - The Lower River Base Camp is a 45-minute boat ride upstream from the Native village of Quinhagak, (pronounced Quin-Hawk). At the Lower Camp, you'll fish the lower 18-miles of the Kanektok for strong runs of all five salmon species fresh from the sea. 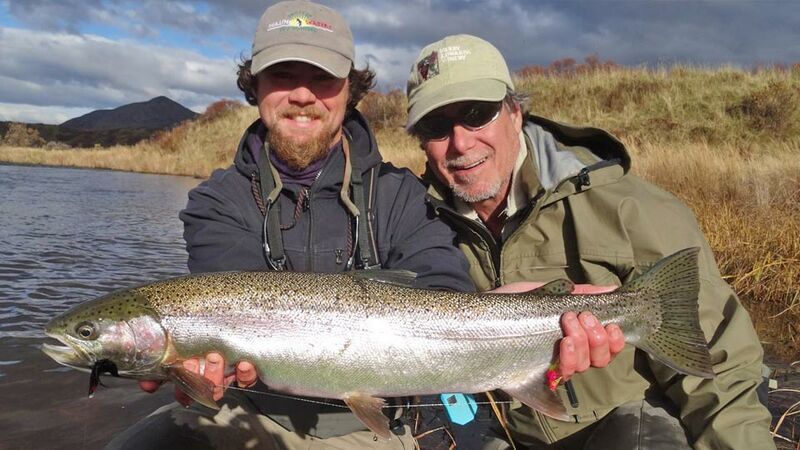 The Lower Camp also has great fishing for up to 30-inch leopard rainbows, dolly varden, and grayling. The Upper Base Camp is two hours upstream from Quinhagak, approximately thirty miles. Duncans’ Upper River camp is the only semi-permanent operation allowed in the Wilderness Area of the Togiak National Wildlife Refuge. Here, you'll be in the heart of the best trout water known as the braids section of the river. 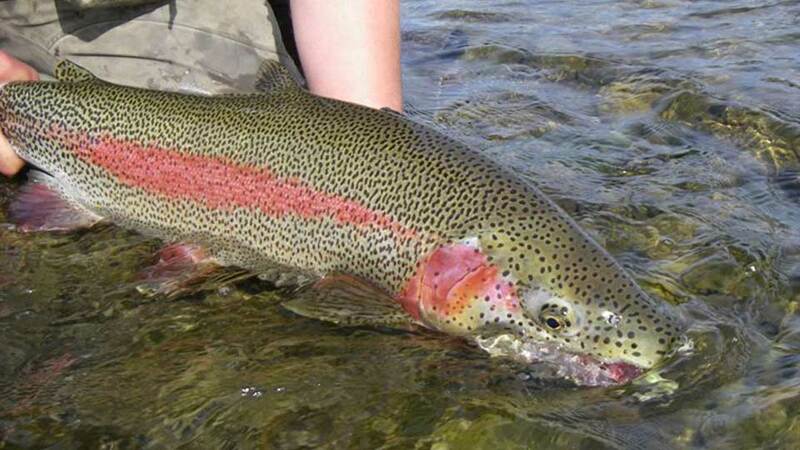 Great mousing and streamer fishing for big leopard rainbows. Skate dry flies for dollies. The Upper Camp also has excellent salmon fishing along with dollies, and grayling. 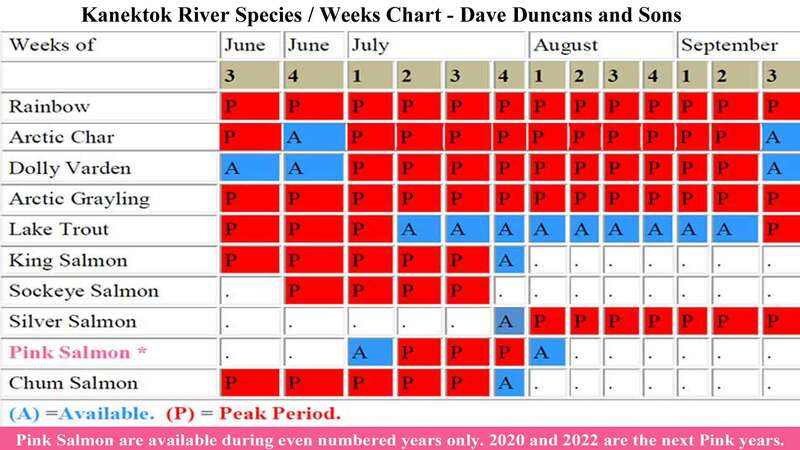 The Duncans also offer a 90-mile Kanektok River Float Trip. Float trips are limited to eight guests, with one guide and two anglers per raft. Click here for Kanektok River float trip. Click here for Duncans' Mousing Video. 2019 Season: July 22 - August 31, 2019. Boats: Each day, they use Willie powerboats to access the best side channels and stretches of the river. Two anglers per guide and boat. Equipment: 4-weight, 6-weight, and 8-weight fly rods and reels are available for you to use. Fly Tying: Camps have fly-tying benches with all the materials and tools needed to tie flies. Flies: We’ll send a detailed list of what to bring in our confirmation packet. Methods: You'll walk, wade or drift fish from the boat. Guides: Each day you’ll be teamed with a different guide. The owners are also full-time guides. On average, their guides have been guiding for them over six years and some as long as fifteen. 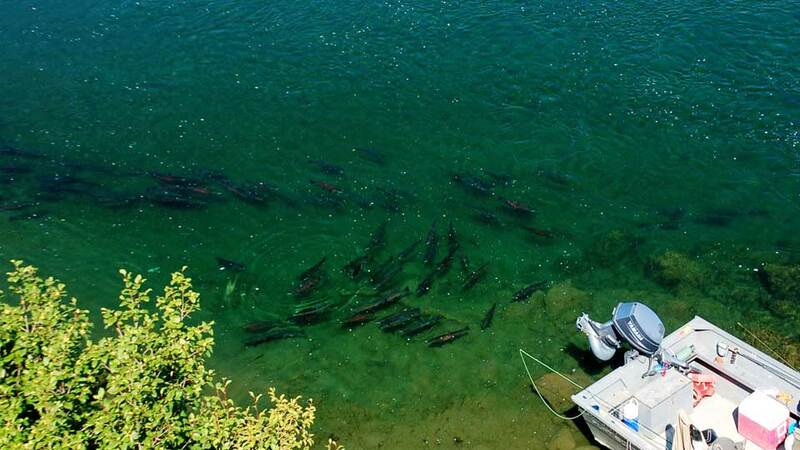 After breakfast, you’ll take off with your guide to target salmon. You'll have a streamside lunch and in the afternoons, pursue rainbows, dollies, and grayling. About 5:30 or so, you'll return to camp, freshen up, and in the dining tent, you'll enjoy a hearty dinner. Fishing License: are not included in the package ($70.00 in 2018). If you are fishing during king salmon season, you’ll also need a King Salmon Stamp ($30.00 in 2018). Both of their Base Camps have heated, double-occupancy tents, hot showers, and great fishing – right out the front door. 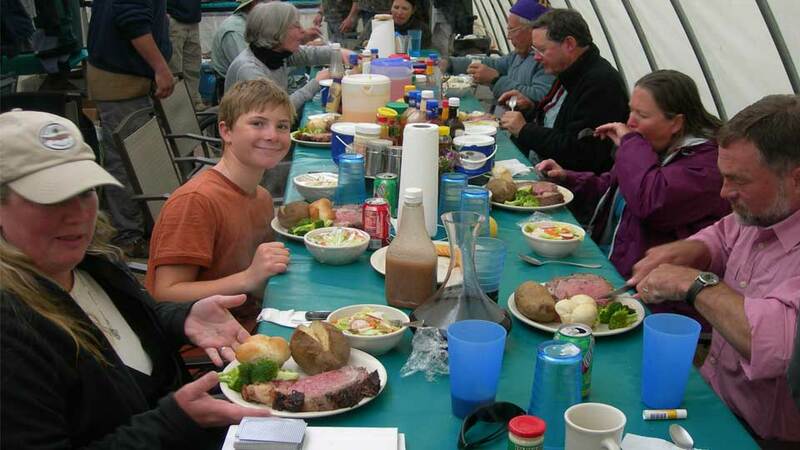 Each camp has a spacious kitchen and dining facilities, and a large social tent. Dinners feature homemade breads and large cuts of quality meats. You can charge your devices in your sleeping tent. The Duncans encourage family outings by offering discounts--children 15 and under are half price. Their camps are equally popular with groups who want to conduct seminars in these unforgettable surroundings. Reservations should be made as early as possible due to the popularity of these trips. Jim Teeny with Kanektok king salmon. 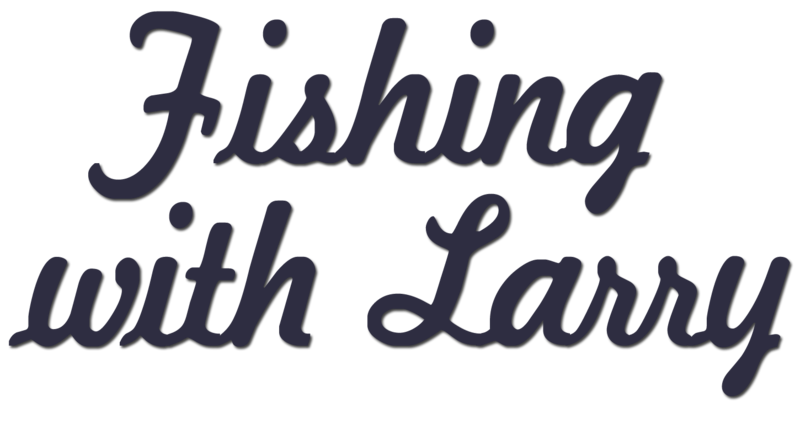 "Over the past 28 years, I've had the pleasure of fishing with the Duncan family for a total of more than 50 weeks! That just about says it all! I am so impressed with the whole family and how they take pride in their operation, putting their customers first with safety always being a top priority. I consider them family and would recommend a trip with the Duncans to anyone planning on going to Alaska. You will not be disappointed." You'll fly from Anchorage, Alaska, to Bethel, about a one-hour flight. Alaska Airlines is the only major airline that flies into Bethel. From Bethel, you’ll take a 30-minute flight aboard Era Alaska to Quinhagak. (Airfare is not included and the weigh limit is 75-pounds.) At the Quinhagak Airport, you’ll be met by the Duncans and their guides. They'll transfer your bags from the aircraft to the boats for your boat ride upriver to camp, which is a 45-minute ride to the Lower Camp and two hours to the Upper Camp. Pack rain gear for the boat ride. Whether you choose a Base Camp or a Float Trip, you'll stay in a very comfortable camp that has dry tents, hot showers, and great fishing — right out the front door. The tents in the Lower and Upper Base Camps are heated. The base camps are deluxe tent camps complete with spacious kitchen and dining facilities, as well as a large social tent. 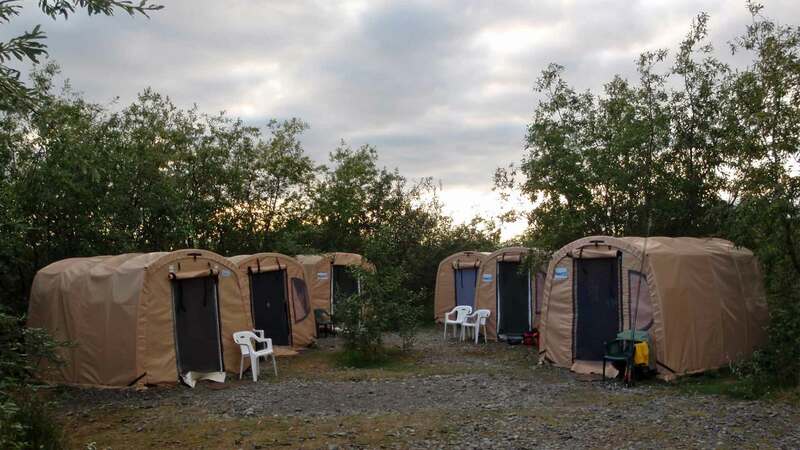 The sleeping tents are spacious, double-occupancy tents that will stay dry in any weather. The tents sit amongst the trees. There are well-worn paths to the food tent, the outhouses, and the river. Click here for Kanektok Float page. Reception at Quinhagak Airport, boat ride to camp, guided fishing, use of rods, reels, fly tying materials, tent camping, all meals at camp, and all non-alcoholic beverages. Airfare, hotels, and meals in Anchorage, fishing licenses, gratuities, or anything not mentioned under inclusions. 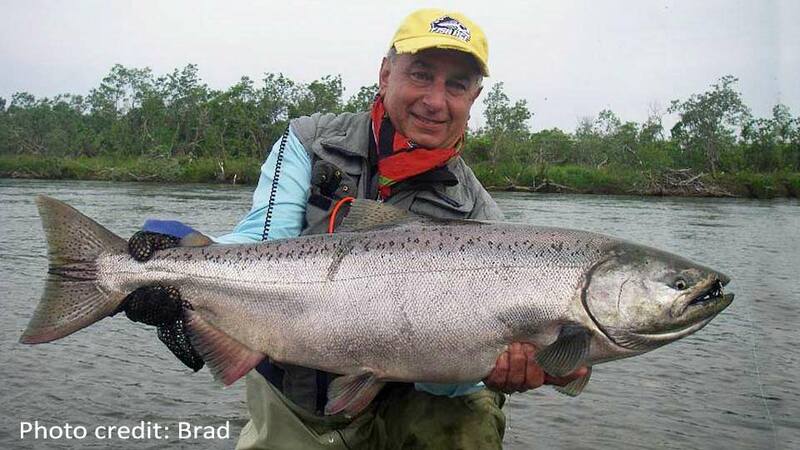 Each season, the Duncans' thirty guests are the only people allowed to fish for these incredible wild Steelhead! The logistics of getting in and out of camp require air dropping gear and supplies from a float plane and then hiking into camp from a nearby lake. Once in camp, all fishing is walking and wading so this trip is only for guests that are in shape and enjoy the exercise.